It started out with light rain so it was surprising to find 10 members huddled over their coffee in Petra’s this morning. Leaving at 7:30, even using the HOV lane, the trip took a good 45 minutes to reach Terra Nova with the traffic on the 99 backed up south as far as the eye could see. Arriving at Terra Nova Rural Park we met up with 7 more of our group who were already birding the river. On the grass between River Road and the river were dozens of Snow Geese and the same of Ring-billed Gulls. The river itself had very few birds beyond two Horned Grebes and some Double-crested Cormorants. We decided to bird the inland part of the park first and then to return along the outer dyke. A light rain was falling and several had their umbrellas out. So, we started by walking through the play area and onto the boardwalk at the first pond which was covered completely with a brownish growth which turned out to be a small floating seed plant mixed in with the native green Duckweed. The closest invasive plant to fit the description I could find was Azolla japonica (I copied a photo from an on-line resource to our Flicker photos). 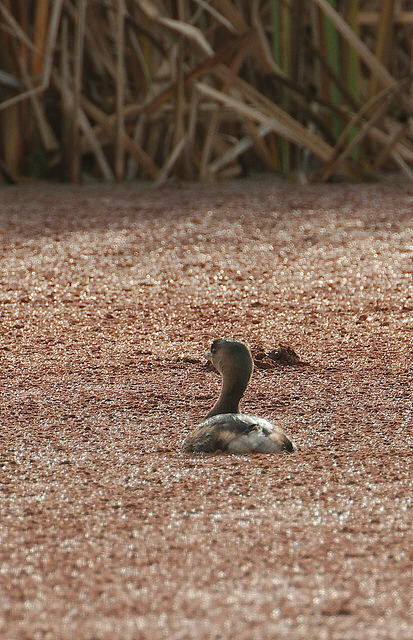 A Pied-billed Grebe was mired in the middle of the stuff and wasn’t moving! Moving along we started to pick up a number of small birds including Golden-crowned, Fox and Song Sparrows, a few Ruby-crowned Kinglets, a flock of American Goldfinches, Spotted Towhees and the usual suspects… robins, starlings, and crows. Janet heard, and sighted, a Northern Shrike. We picked up a few Great Blue Herons along the way. Brian A, being very familiar with the park, led us through the maze of trails and we ended up on Westminster Highway adjacent to the Community Gardens where we go for the annual Raptor Festival. 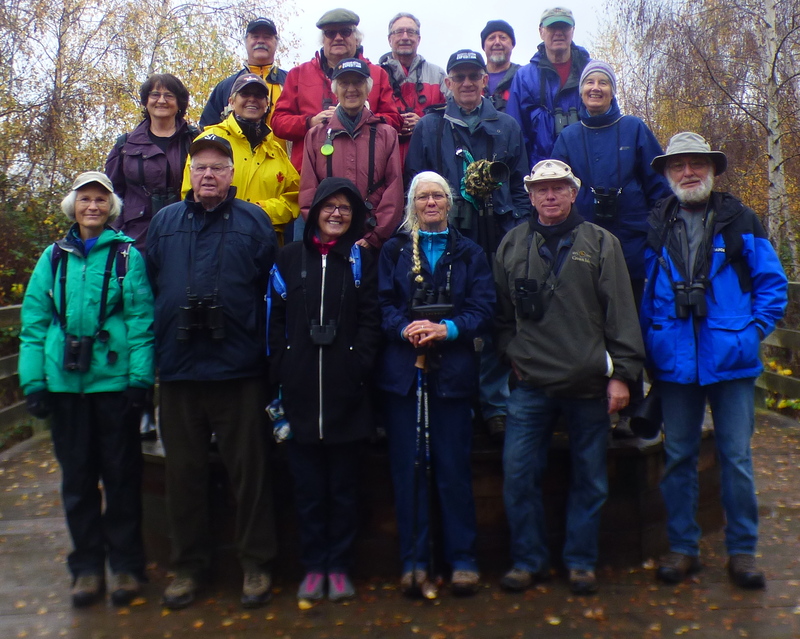 Walking east along the road we entered the south portion of Terra Nova Park and followed the trails to the north boundary of the Quilchena Golf Course where we stopped at a raised platform surrounded by benches and had our obligatory group photo taken with members standing on it. The rain had stopped at this time and we could see blue sky over the ocean. No new birds were seen on that stretch of the trail but for a few Northern Flickers and an Anna’s Hummingbird. In all of the areas there continued to be flocks of American Goldfinches… the most numerous species of the day. The second phase of the trip was the return along the outer dyke where we walked through a gap in the trees to the muddy shore where they had done the “habitat improvement” a few years back. 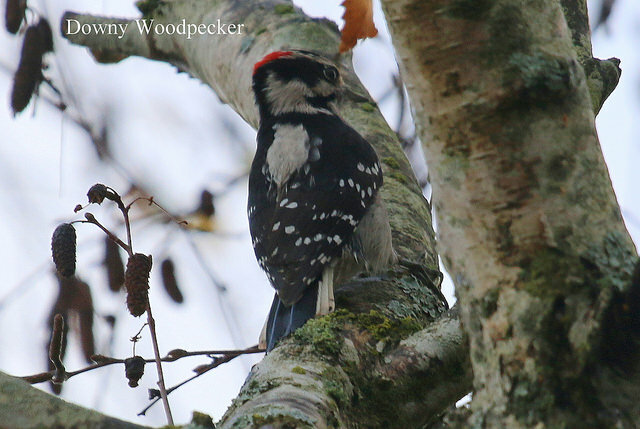 A male Downy Woodpecker was seen here. Scanning about with the scope, a few American Bald Eagles and Northern Harriers were seen, but the highlight bird of the day was,again seen by eagle-eyed Janet, an American Kestrel, probably a juvenile, with very pale markings. We watched this bird for quite a long time as several members had not seen one before. The bird frequently would swoop down from its perch, probably after an insect, and on one swoop looked like it had hit a heron… certainly caused it to move away! (see Terry’s photos), and some Common Mergansers farther out in the water. 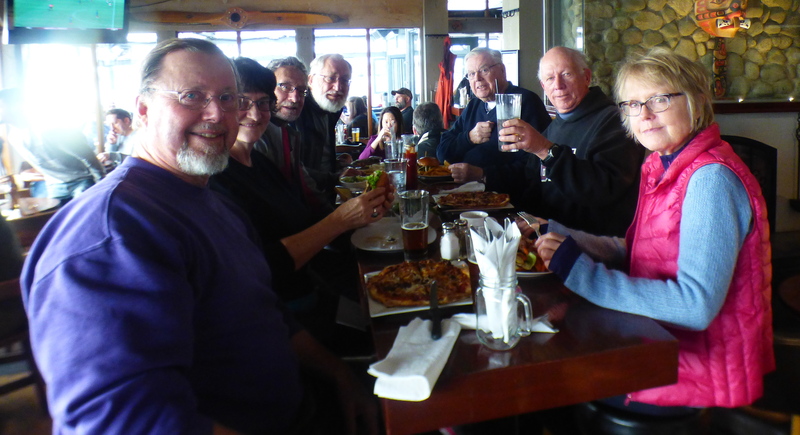 Seven of us decided we would head off to the Flying Beaver Pub, only because it was what Tom would have wanted us to do, for lunch, while some of the more dedicated birders carried on (see the Addendum below by Bryan & Janet). The weather had changed for the better by the end of the trip and it turned out to be much better than we figured it was going to be at the start. Addendum from Bryan and Janet who braved the weather while the rest of us scurried off to a warm pub for lunch… thanks, you two! Bryan and I had tea in the gardens then walked over the street for one last look for the Shrike. No appearance. Bryan spotted two Barn Owls in the nest box – we think a male and a female, perhaps sheltering from the rain? You can just see the two of them in this very long shot. The views in the scope were better. I heard a Kingfisher rattling away. 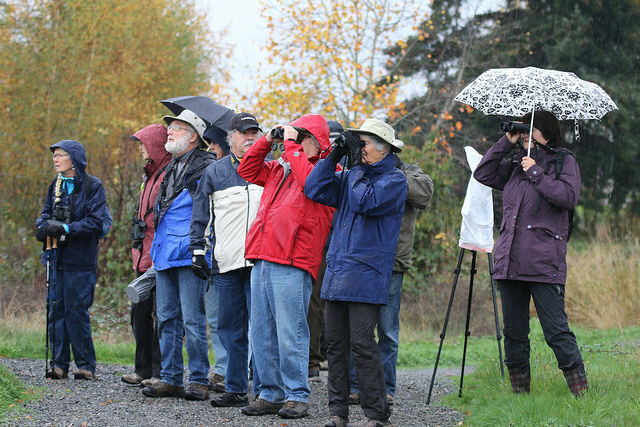 We both saw Golden-crowned Kinglets. And there was a very persistent coyote. We watched him stretch up and paw the lower branches of a tree in the gardens. At the top of the tree two black squirrels looked down at him and then ran back and forth on the upper branches without losing an inch of elevation. The coyote appeared to be trying to turn himself into a cat. Next Tuesday, November 22, we will not to go Harrison because of the weather forecast. We will meet at Petra’s in Tsawwassen at 7:30am and decide whether to cancel the outing or go to Brunswick Point. 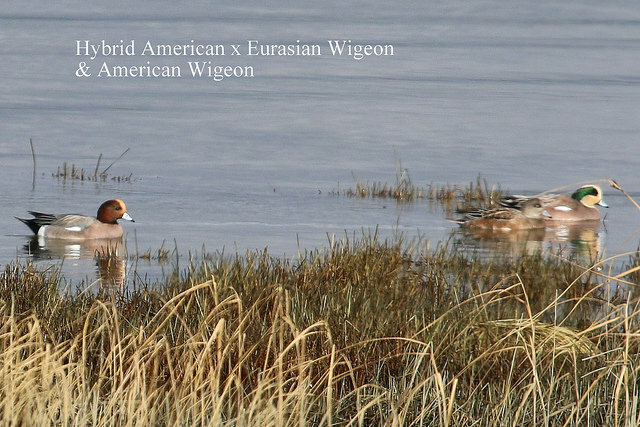 This entry was posted in *DNCB, American Kestrel, Bald Eagle, Barn Owl, Coyote, Eurasian Wigeon, Northern Harrier, Northern Shrike, Pied-billed Grebe, Red-tailed Hawk, Terra Nova. Bookmark the permalink.